WASHINGTON — The Trump administration is pressing to open peace talks with insurgents in Afghanistan by April, a timetable driven by the president’s mounting impatience with the stalemated 17-year-old war. But prospects for a far-reaching political settlement still appear dim, and President Donald Trump faces the risk of a political backlash if he pulls out and the country again becomes a failed state where terrorists could find refuge, as Osama bin Laden once did. Without signs of progress in coming months, Trump could face the same dilemma as his predecessors: withdraw all or most of 14,000 U.S. troops and risk a Taliban takeover, or leave them there indefinitely, even though he and his advisers consider the war unwinnable. "We need the violence to stop," said a senior U.S. official familiar with the internal deliberations. "This is a rare opportunity for every player in this." Khalilzad held preliminary talks in October with Sher Mohammad Abbas Stanekzai, the Taliban's political chief, in Qatar. The insurgency's leaders still refuse to deal openly with Afghan government officials, whom they dismiss as U.S. puppets. In hopes of convincing insurgents to come to the bargaining table, the Pentagon has dramatically stepped up airstrikes, dropping 5,213 bombs and other munitions on Afghanistan in the first nine months of this year, more than in any of the last five years, according to U.S. Central Command. Taliban officials have said for years that their objective is for U.S. troops and other foreign forces to leave Afghanistan. Increasingly, that appears Trump's objective, too _ a confluence that in theory could leave room for a deal. Trump said last month he is cautiously optimistic about ending the conflict, but added that it's "a little bit too early to say what's going to happen." Setting an April target date for peace talks is similar to the approach President Barack Obama tried unsuccessfully _ and was sharply criticized for by Trump _ when he set a 2014 deadline for ending U.S. involvement in most combat operations and withdrew all but 5,500 troops. Obama's plans to lower U.S. troop levels further were delayed amid worsening security. Trump then reversed the drawdown when he accepted a Pentagon recommendation shortly after taking office to send more than 9,000 military personnel back in. "If we left precipitously right now, I do not believe they would be able to successfully defend their country," Marine Lt. Gen Kenneth F. McKenzie Jr., Trump's nominee to head U.S. Central Command, told the Senate Armed Services Committee on Tuesday. Another obstacle is Pakistan, a nominal U.S. ally. Pakistan's security services have long nurtured ties to the Taliban and looked the other way as its leaders and fighters operated from Pakistan's tribal areas on the Afghan border. Trump urged Pakistan's newly elected prime minister, Imran Khan, in a letter this week to join the peace effort in Afghanistan and help Khalilzad, according to a White House official, who spoke on condition he not be identified to discuss internal deliberations. "In the letter, the president recognizes that Pakistan has the ability to deny the Taliban sanctuary on its territory," the official said. Bruce Riedel, a former CIA analyst on South Asia who helped craft Afghanistan policy in the Obama administration, said Trump's complaints on Twitter this year that Pakistan had "given us nothing but lies & deceit" means the White House appeal is likely to be ignored. "I don't think they will help," Riedel said. "Imran Khan detests Donald Trump and doesn't have any reason to do him a favor." The Taliban leadership, calling itself the "Islamic Emirate," warned in a Dec. 2 statement against thinking that it was willing to agree to let U.S. troops stay in Afghanistan, and threatened to continue attacks against any that remain. "If the American officials and generals are of the belief that their occupying forces will remain in Afghanistan and that they will be left alone, then they should reassess their talks," the statement said. Afghan President Ashraf Ghani has laid out his own peace plan that he said would take five years to implement. Khalilzad is on a much faster track. He is urging the Taliban and Ghani's government to at least prepare a blueprint for continuing negotiations on ending the war before presidential elections scheduled for April. Khalilzad said in tweet Thursday that he was in Kabul to discuss "preparations for peace negotiations" with Ghani. "Ghani is not in a good position because there's no consensus about talking to (the) Taliban, and some people in his government and close to his government are adamantly opposed to it," said Thomas Ruttig, co-director of the Afghanistan Analysts Network, an independent think tank with an office in Kabul. Several recent insurgent attacks have killed scores of Afghans in Kabul and elsewhere. The Taliban have steadily gained rural territory and now have an estimated 60,000 fighters, U.S. officials acknowledged this week. 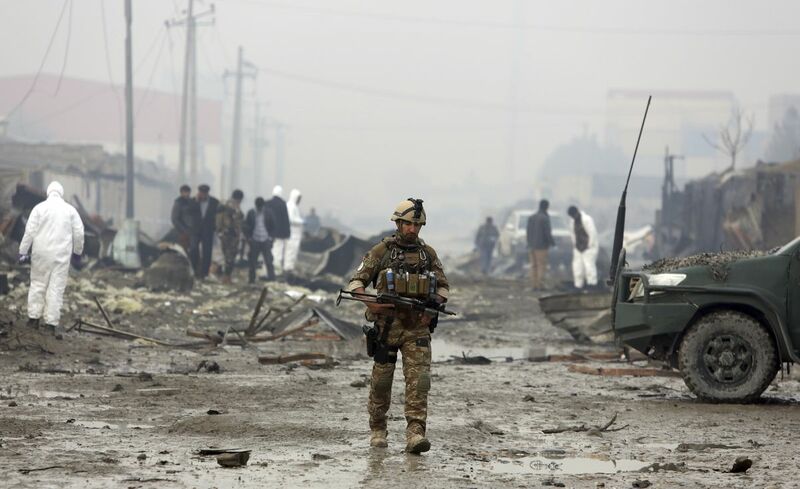 Ghani recently said that more than 28,000 Afghan soldiers and police officers had been killed since 2015 _ a toll so severe that U.S. officials say the force could be irreparably damaged, adding urgency to the push for a peace deal. U.S. officials say this attempt has a better chance because Khalilzad, who was born in Afghanistan before immigrating to the United States, has Trump's backing and has dealt with many of the leaders before. U.S. officials are adamant that any deal should ensure Afghanistan does not again emerge as a haven for terrorist groups intent on attacking the U.S., such as al-Qaida and the Islamic State. They have reassured Ghani and his advisers that Afghan officials will lead negotiations with the Taliban. Army Lt. Gen. Austin “Scott” Miller took command of U.S. and other foreign forces in Afghanistan in September. The U.S. ground troops are primarily training and advising the Afghan army, which now handles most of the combat. "We're near a political settlement," said Col. Dave Butler, Miller's spokesman. "If the Taliban want to keep fighting, we will fight and ensure that they feel the pressure." Four U.S. service members were killed in the last week and 13 since the start of the year. More than 2,400 U.S. military personnel have died since the 2001 invasion _ a cost that Pentagon officials and military commanders do not want to see squandered. Even if the talks do not lead to a deal, many who follow America's longest war fear that Trump could pull U.S. troops out anyway, probably plunging Afghanistan into years more fighting and bloodshed.